Tonight, my flowerpots are so dry the water I pour in forces bubbles out of the soil. Unless I’ve watered it, every plant looks tired of trying to grow. Even the ones I have watered consistently all summer weep in the evening heat. In normal years, I often wonder at the power of flowers and vegetables to produce so much without my intervention. My part in the process is the clearing of a small plot of land, the sowing of seeds, maybe a sprinkle or two of water, and out of that minimal start-up effort sprouts all of this green, all of these blossoms—and then how proud I feel when I pluck a bushel of peas or zucchini, as if I had anything at all to do with their productivity. But this year, it is taking a lot of effort to sustain any kind of growth. If I don’t haul my hose around the house to spray gallon upon gallon of water on the garden and flowers, it only takes a day or two before they begin to show signs of fatigue. I picked the wrong year to plant new shrubs in the front beds—the rhododendron and azaleas seem to drop new leaves every day I neglect to hydrate them. I drag the hose all over the yard, get lost in thought as I soak the soil, careful not to wash the dirt away. In this way, gardening is poetry. Sometimes it doesn’t seem to take much to reap a harvest, a little weeding after an idea is planted, a little pruning off the ends to fill in the center. Other times, it is kneeling in the dirt with sweat slick down your back working at a stubborn root or rock wedged in the soil, just to plant the seed. And then constant attention—water, thin the sprouts, weed, fertilize, weed, water, fertilize. Eventually, all that’s left to do is hope it was enough. When in drought, it helps to have a friend who can come in with a watering can, maybe pull a few weeds with you or simply point out the blossoming fruit. I have one such friend who reads every poem I write. He is in his seventies and doesn’t use a computer. I email poems to him and his wife prints them off. Sometimes he calls and we read through it together, clipping off the suckers and trimming back what’s overgrown, or identifying the work that needs more fertilizer (or where I need to cut the crap…). Most of the time, he writes back on the printer paper, notes his suggestions and shares his thoughts on the potential for this year’s crop. I am a grateful shrub with a tendency to lose some leaves when the weather gets too hot. The landscape prospers in the hands of a master gardener. them to the compost heap. Photograph: Asters by Kelly Sauer. Sourced via Flickr. 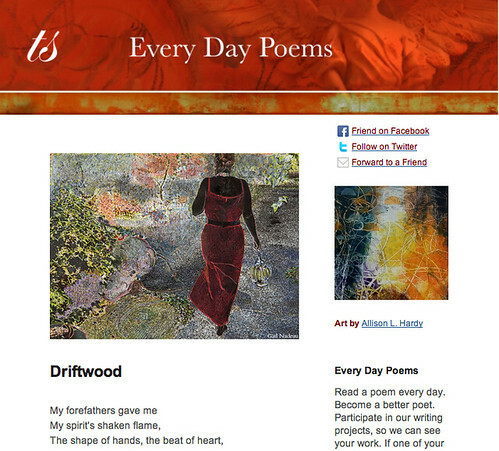 Post by Sarah Wells, author of Pruning Burning Bushes: Poems. I’ve been “kneeling in the dirt” lately and I know, too, how it feels to “produce so much without intervention”. The cutting of the branches. . so hard. . yet, exactly, precisely what we need. May I rest in Him and His perfect timing in all. Fertilizer, bucket of water. . . .
We foolishly decided to plant grass last spring, when Texas was already into the worst drought in 100 years. With careful attention, it lived. Some bare spots remain, but with a little more rain and some extra care, those spots are gradually filling in. I picked the wrong year, you said. And so we maybe learn to be our own kind of tender gardener, if we want life to survive. Really lovely post complemented with Kelly’s wonderful image. I went backpacking last week and saw fields and fields of those wonderful asters. Sarah–I was watering hydrangeas for my sister this week and saw a very long branch, yards away from the roots so spent it literally fell over. there was no water no strength to sustain it. How I thought of our Jesus, the gentle gardener, pruning us to stay close to Him–the Root, to stay watered….to grow fruitful for Him. I connected with this so much–I love your heart.